A waffle is a special type of snacks made with leavened dough baked using a waffle iron (two metal plates) until golden-brown in colour. The metal waffle iron plate is patterned to give a characteristic shape, pattern and size to the waffles. Different types of waffle maker have different patterns, shapes and variations. There are many variations based on the type of waffle iron and recipes used. Some types of waffles include Belgian waffles, Potato waffles, Bergische waffles, Stroopwafels, Brussels waffles and Pandan waffles etc. Different countries have different cuisines for waffles and it might also interest you to know that waffles are more popular in countries such as; the Scandinavians, Belgium, France, Netherlands, the United Kingdom, Germany, the United States, Poland, Hungary. Basically, it is more popular in Europe. Waffles can be served with assorted toppings such as honey, chocolate spread, yoghurt, maple syrup, fresh fruit or whipped cream. I pretty much love all waffles so when I decided to have some waffles for breakfast, it struck my mind that converting the waffles into quiche waffles won't be a bad idea at all. Although the recipe is a first timer for me, coupled with the fact that I am still playing around with my newly identified tomberry tomatoes. But I had the confidence even before the preparation that these quiche waffles will totally come out fantastic. And yes, they did came out perfectly well, just exactly the way I envisaged them to be. 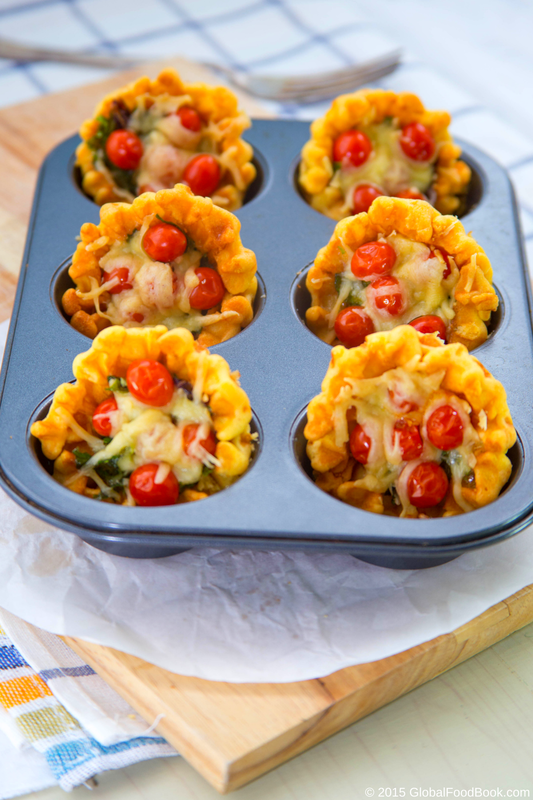 Funny enough, what I initially put into consideration was how grated cheese, eggs, shredded vegetables and tomberry tomatoes would pair up perfectly well with some waffles for some really amazing snacks. Interestingly, what I supposed to be a huge concern finally turned out to be no concern at all. Yes, because all the ingredients did understood themselves perfectly well to present what they were supposed to generate. To get these quiche waffles done, I first of all lubricated my baking tins, gently placed the waffles into the tins and then topped the waffles with the remaining ingredients. To top the waffles, I whisked the eggs with the shredded vegetables before scooping the mixture into the waffles. Afterwards, I then decorated the surface of the whisked egg with the tomberry tomatoes, followed by topping up with some grated cheese before popping the quiche waffles into a pre-heated oven. The quiche waffles were then allowed to bake for at least 10mins before serving. 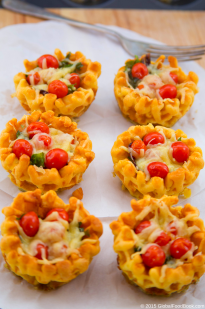 Just follow this simple quiche waffle recipe and your breakfast, brunch, lunch or even dinner is served! Does anyone care for some quiche waffles and a glass of freshly-made orange juice? Yes please! I was planning on eating these quiche waffles with a cup of tea, which I have no doubt would have been very tantalising, but when I remembered a glass of freshly-made glass of pure orange juice in the fridge, I knew that would be a better alternative for me. Oh yes, the fresh orange juice perfectly paired well with the quiche waffles for some really awesome taste and satisfaction. Apart from the yummilicious taste of these quiche waffles, they also look so tempting to the core. I doubt if these quiche waffles would have tasted any better than they did because for me, they were just fabuluos. Munching this brilliant combination of ingredients and flavours made me feel like I was dinning out. I can confidently tell you for sure that this is a recipe that I won't hurriedly forget to try over and over and over again. 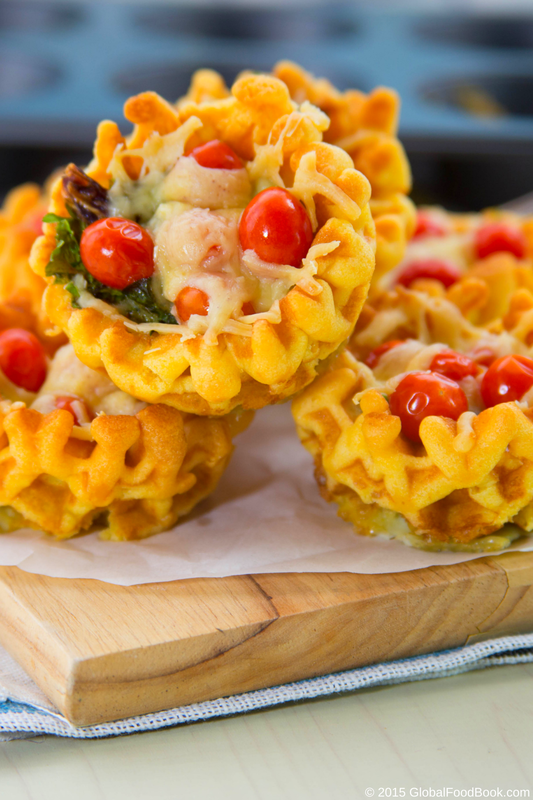 Infact these quiche waffles turned out to be one of my favorite homemade snacks. It's totally a different take on the normal waffles, it's just more tastier, yummier and enticing for a change. But most importantly, you can throw in any edible thing inside the waffles for some really awesome unique tastes. 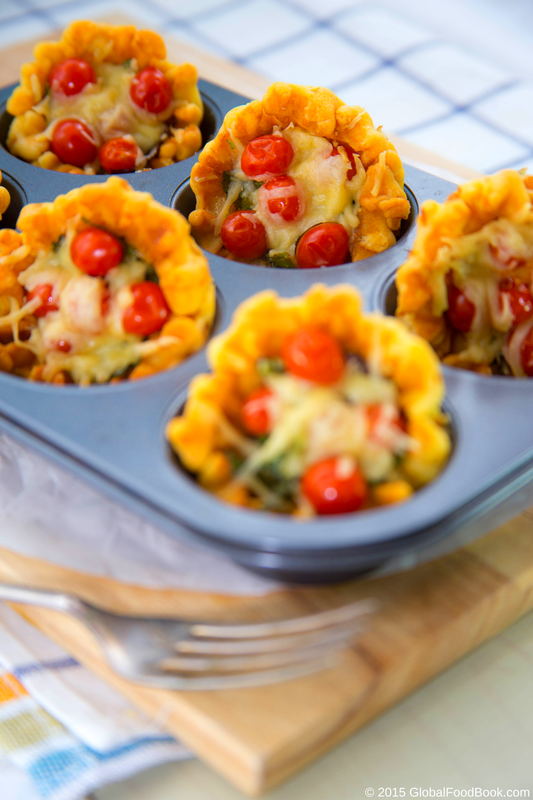 Now that I've done eggs, vegetables, tomberry tomatoes and grated cheese, it's your turn now to get more ideas. For this particular quiche, I really went very simple and easy but yet packed with some really nutritive contents. So easy and so tantalising! 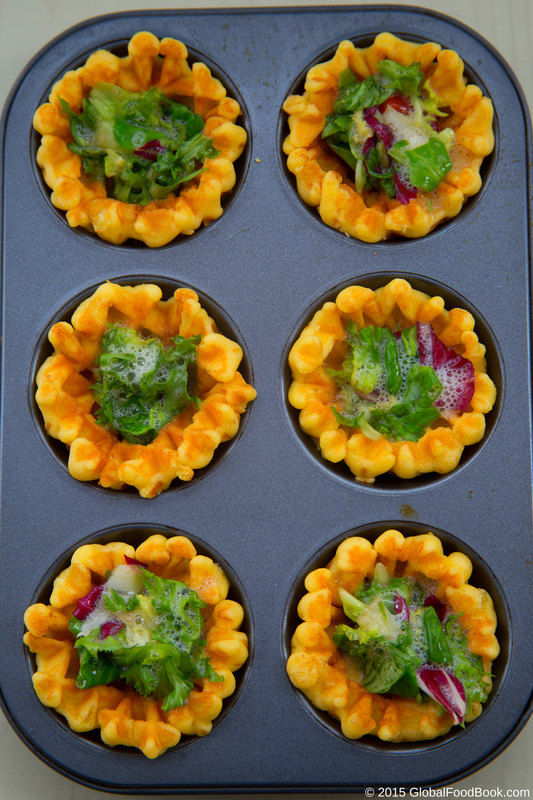 Please feel free to share with us any ideas to tweak the recipe in the comment section. 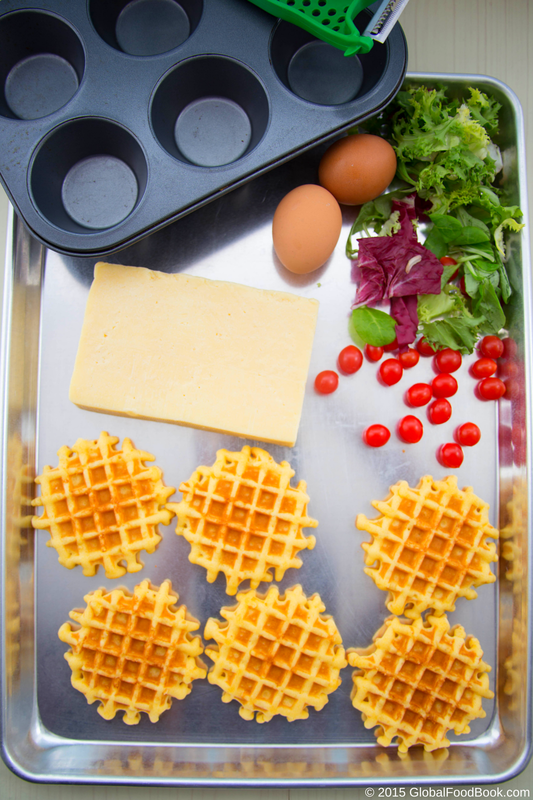 Whisk the eggs with the shredded vegetables together and then scoop the mixture into the waffles. 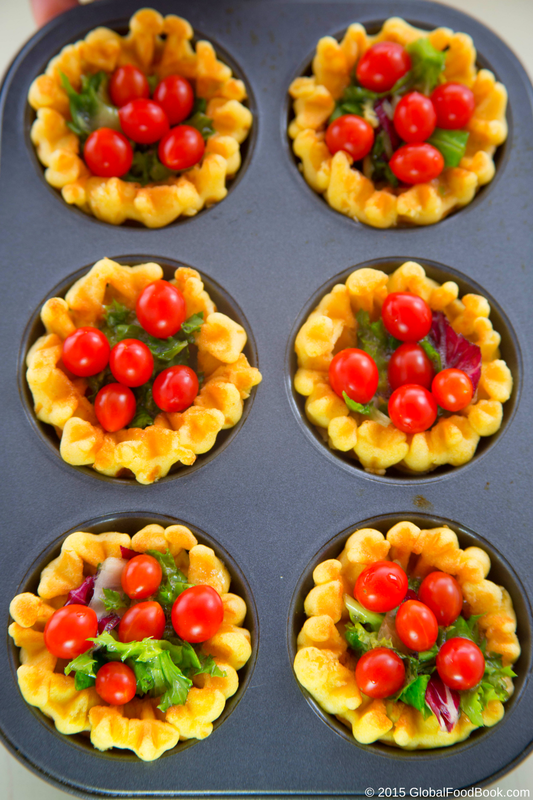 Decorate the waffles with the tomberry tomatoes and then sprinkle the grated cheese over the waffles. 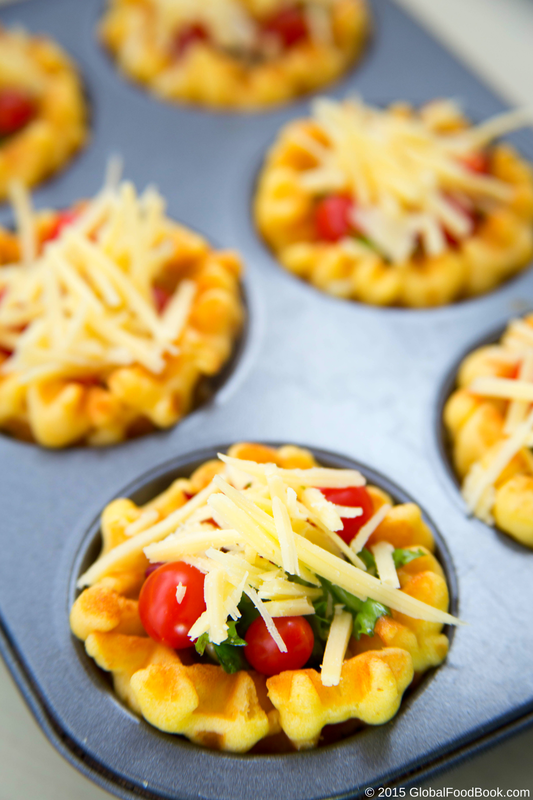 Place into a pre-heated oven of 100-150C and allow to bake for at least 10mins to allow the egg to cook properly. Bring out from the oven and serve warm.